← From the Sunday Bunch by Allen Dronsfield. 2018 08 05. YOUNGSTERS WHIP OLD-TIMERS by OLD TIMER EARL BALL!! 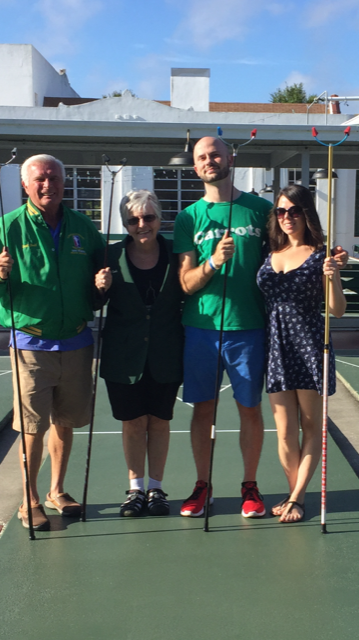 1000 Point, “Green Jacket Masters”, Earl Ball and Joan Cook traveled to St Pete on Sunday Morning to be hosted by the young couple, maybe future “Green Jacket Masters” Erik Hahmann and Kerry Bailey in a match. Erik double kitchened Earl about mid-way through the 1st game and they out-ran the Old-timers to the finish line. With Earl and Joan nipping at their heels, Kerry coolly made the winning hammer from the foot to put an end to the come back! Earl and Joan bounced back and won the 2nd game while Erik struggled to get a handle on the yellow blocks: Kerry wasn’t quite strong enough to carry him. On to game three. Earl and Joan went back to yellow, just certain they could handle the kids on either color—Wrong! The early part of the game was OK but then Erik got Earl for 22 on his hammer and try as she may, Joan couldn’t rescue him. It was a beautiful day for a 9:00 match. Earl and Joan showed up on Old-timers time at about 8:25 and the youngsters did get there before nine but who could blame them after finding out they were at the Ray’s baseball game the evening before, two rows behind the Ray’s dugout courtesy of Stu Sternberg, the Ray’s Owner. Did I mention, Stu is a member of the St Pete Club and is friendly with Erik. I bet you don’t know when Erik and Kerry are getting Married on Court 5 where they met and where Erik Proposed: I Know!